Mau Tau Cara Kerja Sabun..? To understand what is needed to achieve effective cleaning, it is helpful to have a basic knowledge of soap and detergent chemistry. Surfactants are classified by their ionic (electrical charge) properties in water: anionic (negative charge), nonionic (no charge), cationic (positive charge) and amphoteric (either positive or negative charge). Soap is an anionic surfactant. Other anionic as well as nonionic surfactants are the main ingredients in today’s detergents. Now let’s look closer at the chemistry of surfactants. 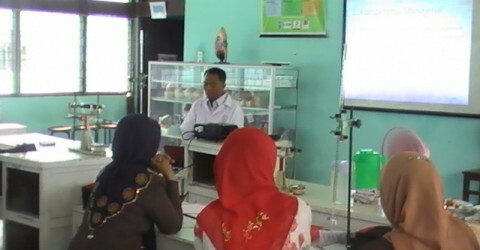 First let’s examine the composition of fats, oils and alkalis; then we’ll review the soapmaking process. The fats and oils used in soapmaking come from animal or plant sources. Each fat or oil is made up of a distinctive mixture of several different triglycerides. An alkali is a soluble salt of an alkali metal like sodium or potassium. Originally, the alkalis used in soapmaking were obtained from the ashes of plants, but they are now made commercially. Today, the term alkali describes a substance that chemically is a base (the opposite of an acid) and that reacts with and neutralizes an acid. The common alkalis used in soapmaking are sodium hydroxide (NaOH), also called caustic soda; and potassium hydroxide (KOH), also called caustic potash. Saponification of fats and oils is the most widely used soapmaking process. This method involves heating fats and oils and reacting them with a liquid alkali to produce soap and water (neat soap) plus glycerine. The other major soapmaking process is the neutralization of fatty acids with an alkali. Fats and oils are hydrolyzed (split) with a high-pressure steam to yield crude fatty acids and glycerine. The fatty acids are then purified by distillation and neutralized with an alkali to produce soap and water (neat soap). Although soap is a good cleaning agent, its effectiveness is reduced when used in hard water. Hardness in water is caused by the presence of mineral salts – mostly those of calcium (Ca) and magnesium (Mg), but sometimes also iron (Fe) and manganese (Mn). The mineral salts react with soap to form an insoluble precipitate known as soap film or scum. Some soap is used up by reacting with hard water minerals to form the film. This reduces the amount of soap available for cleaning. Even when clothes are washed in soft water, some hardness minerals are introduced by the soil on clothes. Soap molecules are not very versatile and cannot be adapted to today’s variety of fibers, washing temperatures and water conditions. I know, hard water is a bummer. We found an easy water treatment solution. My husband got a Scalewatcher electronic descaler. Since then my psoriasis has disappeared, we no longer need to use skin moisturizer, hair is squeaky clean, no more hard water spots to clean. Also our water heater is heating up the water much faster than before, I guess it’s gotten cleaned up inside. We got ours from http://www.AquaGenesisUSA.com because they support non-profits like Greenpeace and Oxfam. Why are you using english??!!! about a subjects, it takes a longer time to understand the subject in English!! don’t you know that english is hard??! mEMBUAT sABUN YUuuk..!!! Proses Detergen mengangkat Kotoran.